When is Surgery for Treating Tonsil Stones Necessary? Many individuals experience the common condition of tonsil-stone formation. Although this disorder is not medically serious, it can lead to bothersome symptoms and discomfort for some patients. Because tonsil stones frequently reappear despite your best efforts to treat or to prevent them, surgery for treating tonsil stones is the only way to be rid of problematic tonsil stones forever. Tonsil stones form when debris such as food particles, dead cellular material, mucus, and foreign pathogens accumulate on the surface of the palatine tonsils. Your tonsils are two oval-shaped lymphatic organs that are located on either side of the back of your throat. A layer of pink mucosa containing pits and channels covers the surface of your tonsils. These crevices are known as the tonsillar crypts, and they vary in size depending on your genetics and certain pre-existing health conditions. Once debris accumulates in the tonsillar crypts, it begins to decay and calcify into small, pale-colored masses. 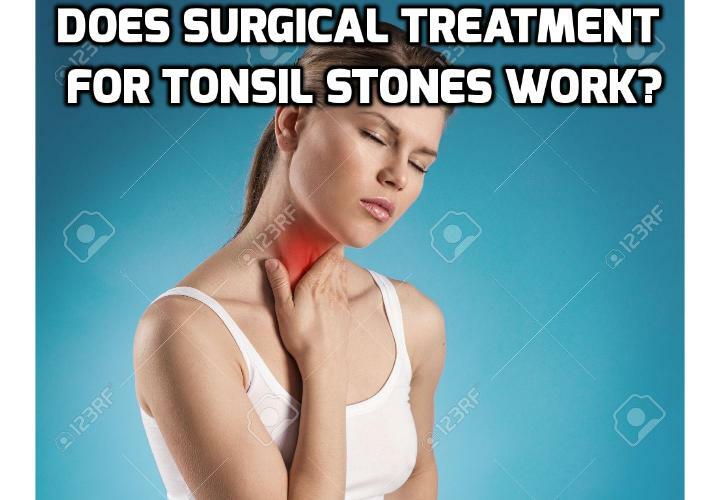 Most individuals who develop tonsil stones do not experience significant side effects, as the majority of tonsil stones are small and not bothersome. In rare cases, however, patients may suffer from unpleasant symptoms such as painful swallowing, a chronic sore throat, earaches, persistent bad breath, and swollen tonsils. Even though these symptoms are uncomfortable and problematic, they are rarely dangerous and do not harm your overall health. If you are concerned about your tonsil stones, see your doctor for an examination. He or she can remove any visible tonsil stones during your visit and may suggest various options for treating tonsil stones to reduce your symptoms. If these methods are not effective for you, then you may need to see an ear, nose, and throat specialist to discuss potential surgery for treating tonsil stones. Surgical methods for treating tonsil stones may involve the removal of any large or particularly bothersome stones. Alternatively, you may need to have your tonsils removed entirely if they are chronically inflamed. This procedure is called a tonsillectomy, and it involves the removal of both palatine tonsils. Patients usually recover from having a tonsillectomy within two weeks. As with any surgical procedure, tonsillectomy may involve risks such as bleeding, swelling, infection, and reactions to anesthetics. Your doctor can help you make the best decision about surgery for your health needs. Previous PostPrevious What is the Link between Size and Shape of Tonsils and Tonsil Stones Formation? Next PostNext What are the Symptoms of Tonsil Stones?